When traveling solo, so much of your experience depends on who you meet and where you stay. For me, the two go hand in hand and are two major factors that will determine the success of your trip. I recently returned from a weeklong solo trip in Colombia, and absolutely fell in love with the city of Medellín. I had the time of my life, met so many awesome people and became seriously obsessed with solo travel. 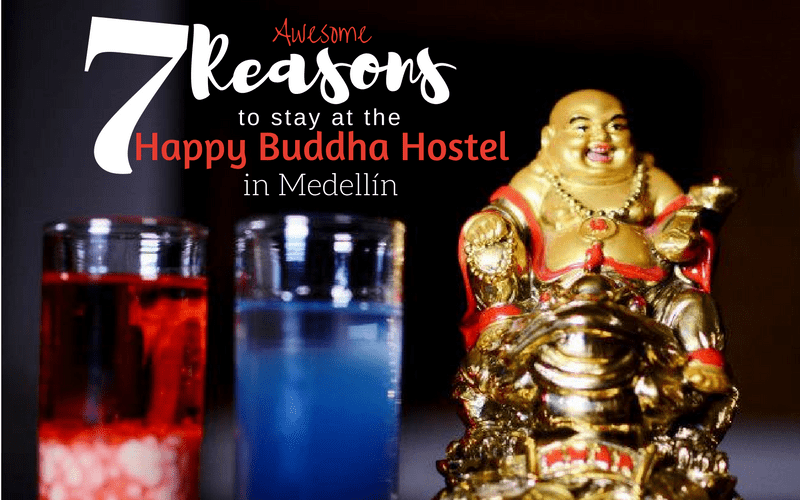 You may have already guessed from the post title, but I owe so much of my memorable experience in Medellín to my stay at the Happy Buddha Boutique Hostel and the people I met there. Pretty much any young traveler, solo tripper or backpacker who’s passed through Medellín already knows the name: Happy Buddha. It’s without a doubt the most popular hostel in the city and with good reason. Simply put, The Happy Buddha is the place to be. Even if you’re not staying there, you better believe you’ll be there at some point. There’s always something going on at the Buddha and its “Tree Bar,” constantly filled with foreigners from around the world, is an awesome place to start your night. 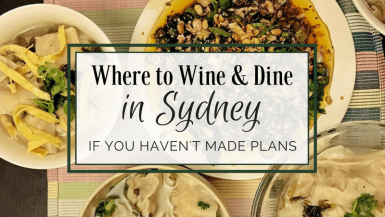 Sure you can visit even if you’re not a guest, but why not stay right in the center of it all? Not enough reason to book your stay? 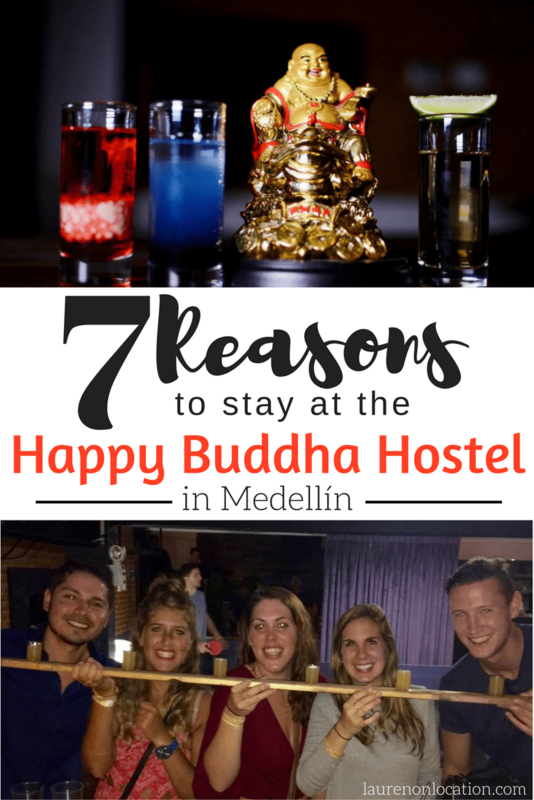 Here are 7 other AWESOME reasons to stay at the Happy Buddha in Medellín. 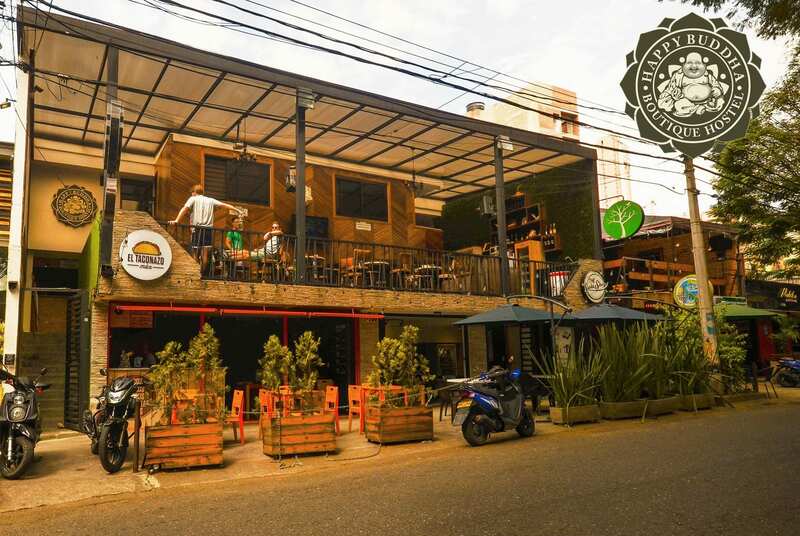 The Happy Buddha is located smack in the middle of Medellín’s trendiest neighborhood, El Poblado. The hostel is short walking distance from luxurious creature comforts like swanky restaurants, chic boutiques, cafés, yoga studios, juiceries and well, you get the picture. 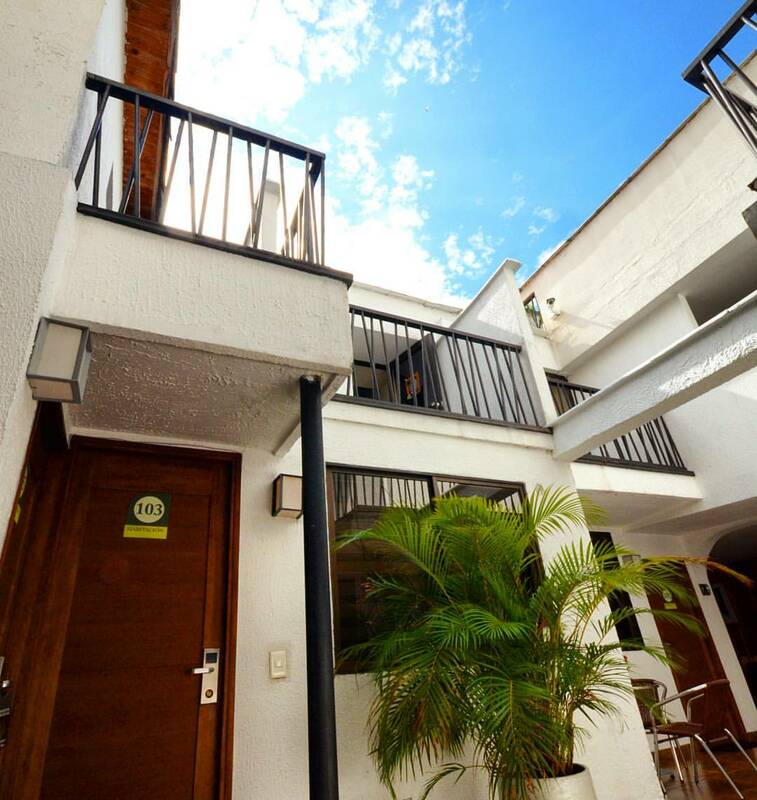 It’s also steps away from Medellín’s popular nightlife hub Zona Rosas, in the area surrounding Parque Lleras. The El Poblado neighborhood is home to the young, beautiful and fashionable and with an apparent police presence it’s also one of the city’s safest spots to wander. I’ve stayed in plenty of private rooms at many different hostels before, but Happy Buddha’s two person suites blow all the rest out of the water. 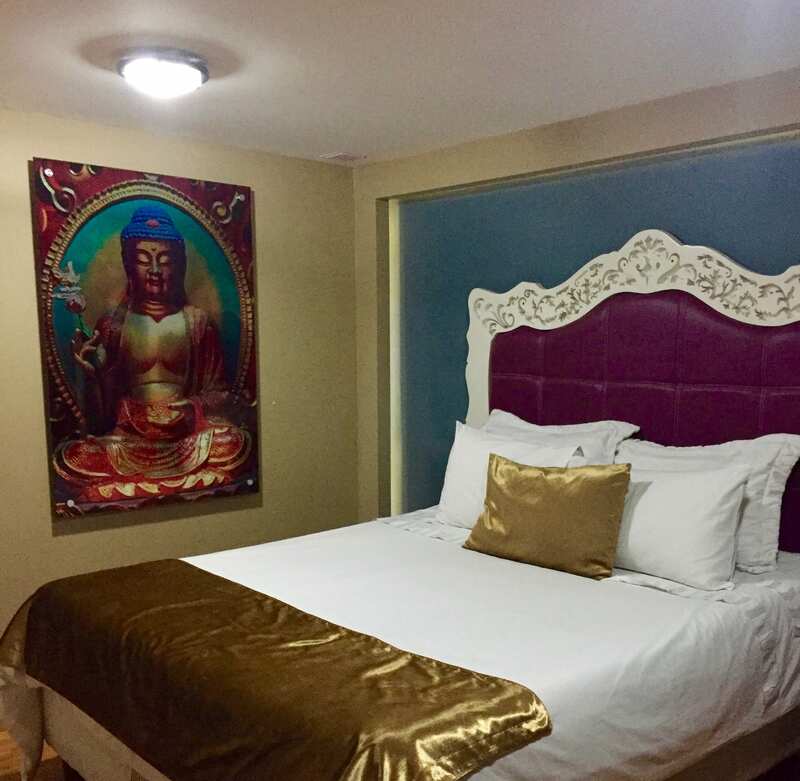 The private rooms at Happy Buddha are fit for a king (or queen) and are equipped with mini fridge, safe lock box, flat screen TV, spacious heavenly showers, fresh towels and complimentary soap and shampoo. My jaw literally dropped when I opened the door to my room. Two minutes rolling around in my luxurious fluffy white bed and I completely forgot I was staying in a hostel. *Note to save face: After sleeping on many couches and staying in smelly 10 person mixed dorms, this room was pretty exciting …. At the Happy Buddha it’s damn near impossible to be bored. There is always something to do. They advertise all of their specials, activities, events and tours at the front desk and their helpful staff is full of information. With exclusive discounts and bookings on an endless number of tours and classes including salsa lessons, paragliding, paintballing and other day tours, they’re sure to have an activity to fit every traveler’s taste. 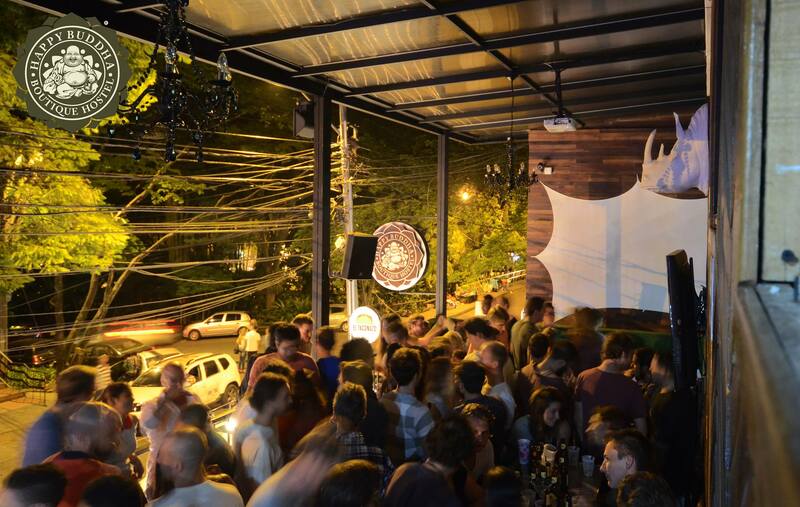 The Happy Buddha has also partnered up with Poblado Pub Department to offer awesome nightly events. 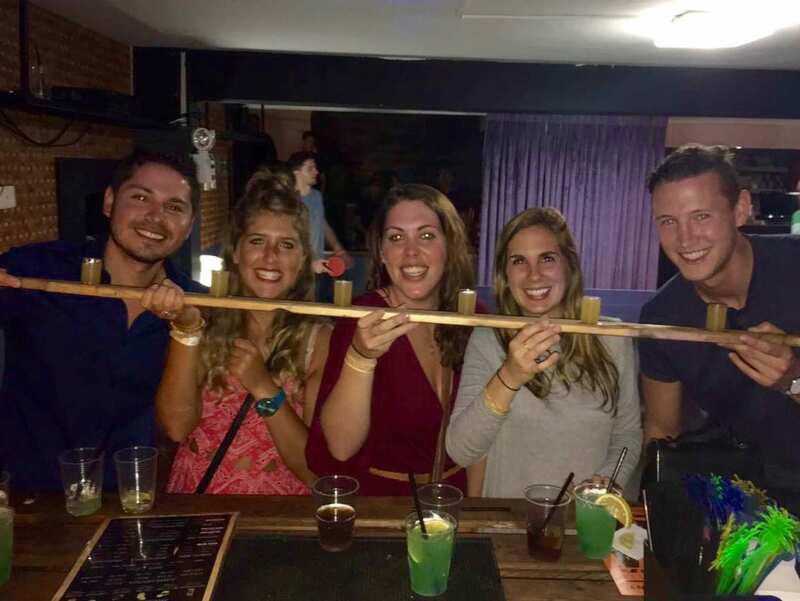 The Tree Bar at the Happy Buddha is always full and with kickass events like Messy Mondays, “Shots & Salsa,” and Ladies Night, you don’t even have to leave the hostel to get your drink on. 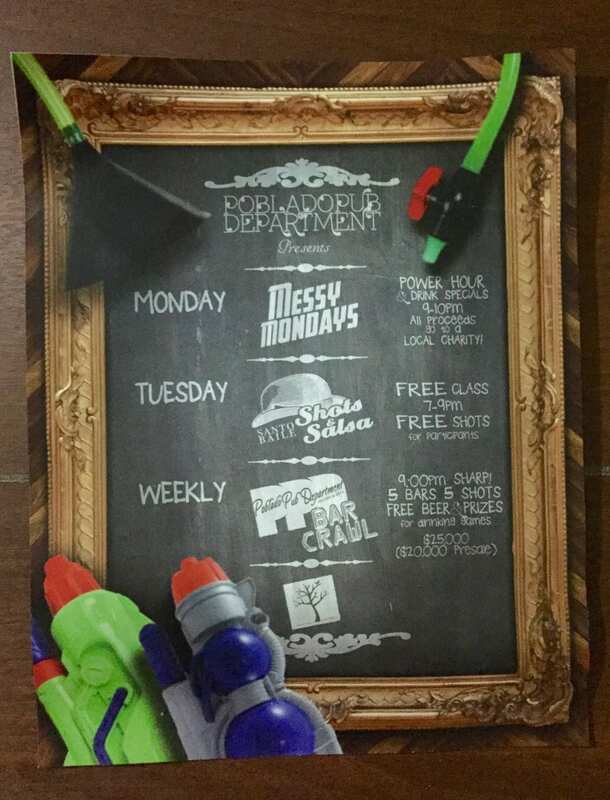 The above-mentioned Messy Monday event is jointly run by the Happy Buddha and Poblado Pub Department every Monday at the Tree Bar. The 60-minute Power Hour allows guests (and visitors) of the hostel to effortlessly give back to the local community. All profits are put towards a good cause, whether benefiting different local organizations and charities or going directly to local families in need. Yeah, you read right, “doing good” at the Happy Buddha is as easy as throwing back some shots. While we’re on the subject of Poblado partying, let me quickly talk about the Happy Buddha’s Wednesday Night Bar Crawl. Also run by the crazy crew over at PPD, the Buddha Bar Crawl is kind of a big deal. It’s the biggest and longest running crawl in all of Medellín, usually drawing in over 80 eager crawlers a night! 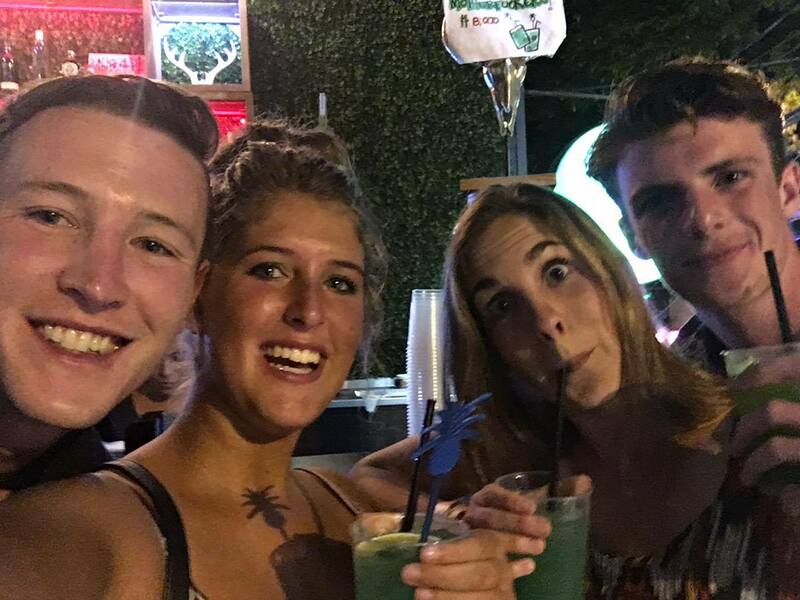 For less than 10USD you can join the pack and visit five of Poblado’s hottest spots where you’ll be welcomed with free shots and exclusive discounts! Pardon my French. And no, I’m not saying goodbye just yet. If you’re wondering why I’m bolding profanities, you’ve obviously never tried an “Adios Motherf*cker.” You can find a big ol’ jug of this potent bright green beverage atop the Happy Buddha bar and dangerous as it is, it’s sure to get your night started right. I was a bit repulsed by this drink at first, but at less than $3USD a pop, it quickly became my beverage of choice. (What can I say. I’m low on funds….) Suffer through a few sips and they tend to grow on you… go figure. I’m still not exactly sure what’s in these things (also not sure I want to know), but I definitely had some great nights fueled by these bright green beauties. Yes, I know. I just extensively highlighted the party aspects of the Happy Buddha. But, the truth is that Happy Buddha Boutique Hostel is so much more than your typical party hostel. I have to admit I had really low expectations when it came to sleep and cleanliness for my stay at the Happy Buddha. I don’t usually expect too much from any hostel with such a crazy “party reputation.” But, The Happy Buddha is not your average party hostel. It was impeccably clean (actually one of the cleanest hostels I’ve ever stayed in) and the rooms were spacious and comfortable. The bar is a separate entity from the rest of the hostel and was separated from rooms by a divider and a door that only guests are allowed to enter. Most importantly, there is a security team during the night to keep order and the bar closes at 2AM. After two, everyone was asked to leave the bar and no one was allowed to remain in the common areas. They took this very seriously. Needless to say, I was very surprised. I thought the balance was awesome. Sure the Happy Buddha was a really fun place to stay, meet people and a provided a great start to your night, but it’s also good place to rest and get some real shut-eye! Rooms: Available rooms include hotel quality privates and spacious shared dorm rooms. For more photos and information on Happy Buddha Boutique Hostel check out their Facebook page. You can book your stay at Happy Buddha here. Welcome to my AWESOME Accommodation Series, where I feature exceptional accommodation from my travels around the world. In this series I’ll highlight unique and memorable lodging that made a significant difference in my travels! As a traveler on a pretty tight budget, I’m a big fan of youth hostels and alternative accommodation like AirBnB! Click here to see where else I’ve stayed! What do you look for in a hotel or hostel? Would you like to stay at the Happy Buddha? Liked this post? Pin it and save for it later! Disclaimer: I received a free stay at Happy Buddha Boutique Hostel for purposes of this post. Still, as always, all opinions expressed are my own. I would only recommend something that I genuinely felt would benefit my readers. This week I’m highlighting The NEON District in Norfolk, VA & Thoughts on Creative Placemaking by Setarra! This post was so interesting to read and really opened my eyes to the wonders (& dangers) of Creative Placemaking. Her colorful pictures and insight into this concept are so inspiring! If you haven’t already, be sure to go check out her post and spread the love! Thanks for linking up with us Setarra! **Wanderful Wednesday Announcement- Facebook Group- add to our community with open conversations. If you would like to be added message me on my Facebook – Lauren Bonheim or Lauren on Location and I will add you 😀 .. Been having a hard time finding everyone by name on Facebook.. It looks like so much fun!! And well, a little partying never hurt anybody! That drink sounds so dangerous… And so good. lol. That room is the nicest hostel room I’ve ever seen! So glad you enjoyed it. My friend has been teaching in Medellin for a few years and LOVES it! First of all.. I’m SO jealous of your friend. Medellín is an awesome city! And isn’t the room SO nice?! I seriously forgot I was in a hostel. After staying in a muggy dorm room for a few nights, this was heaven! It’s leaning hour at the happy Buddha tower! Sounds fun. This place looks amazing! Look how cute those rooms are! I like a hostel that balances party with sleep. You don’t want to be bored but sometimes it’s nice to have a sense of calm at 3am. Yes exactly! The Happy Buddha was the perfect balance for someone like me, who likes to party but definitely values a nice, comfortable sleep! I never thought that a hostel could be so nice! I’ve never stayed in a hostel before, but I feel like I’ve heard a ton of horror stories about them, and obviously Happy Buddha squashes all of those stories! Not only do the rooms look super nice, but that’s awesome that they have so many things to do to encourage people to know each other! Those green drinks sound like a lot of fun! The Happy Buddha had an awesome balance between relaxing and partying! That’s why I liked it so much! I love hostels though! If you stay in the right one, their shouldn’t be any horror stories to tell! That certainly does sound like a hostel with a difference. The room looks nicer than a lot of hotels I’ve stayed in before! It’s also great that they make everyone shut up at a certain point. Party hostels are fun but sleep is good too! I so agree! I’m always down for a good party- but you don’t want to see me running on no sleep- ain’t pretty! That bed looks super comfy! What an awesome-looking hostel! My biggest issue with party hostels is when the party keeps going for way too long (like a hostel I stayed at in Mexico City, where the music didn’t shut off until 5am!!) but it sounds like they do a nice job of setting separate times for partying and sleeping here. Colombia is wayyy high on my bucket list, so I’ll keep this place in mind! The Happy Buddha Hostel looks amazing! Such a luxurious room and I love that video, hahaha! 😉 Choosing the right hostel can really make or break a stay so it’s always good to hear recommendations. I love a good hostel, and I think they are generally underrated by some people. I wouldn’t stay in a dorm room anymore, but I love how most hostels offer private rooms! What a fun looking hostel!! And I love that their happy hour includes giving back to the local community! What a great idea! I must admit I’m kinda scared of hostels (never stayed in one in my 2.5+ years of travel!). I need a clean bed & bathroom!… and I’m not really into the party scene anymore, and I feel like maybe I’m too much of an introvert?? Like what if people don’t talk to me haha. Or what if I don’t feel like drinking and others think I’m anti-social! The private rooms in this one looks really amazing though, and I think I’d be comfortable with that! And ah yes… I know about the Adios MF… oh college days. That suite looks WAAAY nicer than any other hostel room I’ve stayed in! Hostels that work hard AND party hard really are the best!!! I think if I would have come to Europe younger than 25 (and if I had not cared for college…), I would have totally started working in one! Love that it was a ton of fun, but made for a secure experience, too! Do you think that Medellin would be a nice city for family travel? I’m curious because I’ll be going to a wedding in Bogota next year and am thinking about traveling elsewhere in the country as well. Ahhhh, the Happy Buddha sounds like perfection! I’ve always been nervous about staying at hostels after having some unsavory experiences in Argentina – but this looks very nice! Colombia is an amazing destination, indeed. I went to Cartagena a few years ago and loved it. Would love to get back and explore more of the country!